Just as you can add miscellaneous comments via the Image Comment feature to images on your Nikon D3400, you can embed copyright information within your image and movie files. Again, the copyright information is stored as metadata and can be viewed on the camera in some playback modes and also when looking at the photo or movie in some photo programs and apps. Including a copyright notice is a reasonable first step to prevent people from using your pictures without permission. Anyone who views your picture in a program that can display metadata can see your copyright notice. Obviously, that won’t be enough to completely prevent unauthorized use of your images. And technically speaking, you hold the copyright to your photo whether or not you mark it with your name. But if you ever come to the point of pressing legal action, you can show that you did your due diligence in letting people know that you hold the copyright. To add a copyright notice, choose Copyright Information from the Setup menu, as shown on the left. You see the screen shown on the right in the figure. You also can tag files with copyright information. Select Artist to display the same keyboard screen provided for adding image comments. Enter your name. Then return to the first Copyright Information screen (right screen) and select Copyright to display a keyboard where you can add that information. The Artist field can hold 36 characters; the Copyright field, 54 characters. 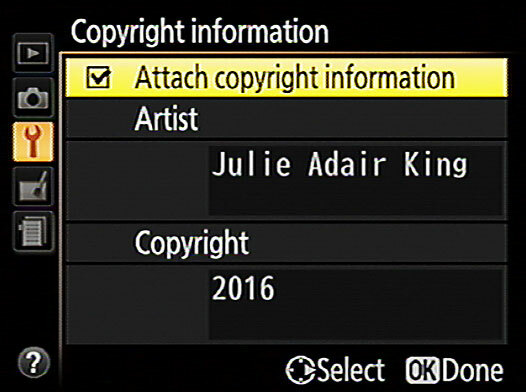 After you enter your data, it appears on the Copyright Information screen, as shown in the following figure. If everything looks good, select Attach Copyright Information to turn on the check mark in the accompanying box. Then press OK. To disable the copyright embedding, turn the Attach Copyright Information option off. After entering your copyright data, select Attach Copyright and press the Multi Selector right to put a check mark in the box.